Paula Deen’s Lumberjack Feud in Pigeon Forge offers a comfortable stadium to view plenty of action, skill, and entertaining activities up-close in a fun-friendly environment. 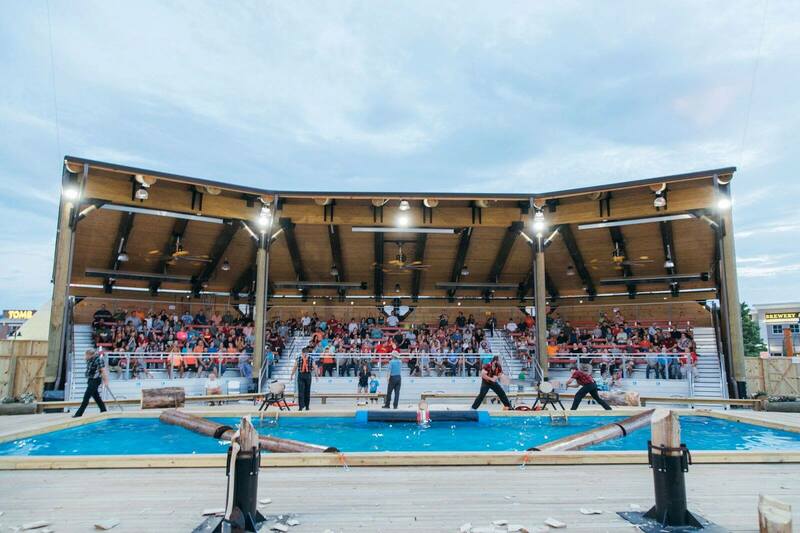 With an energy-packed atmosphere, a climate controlled stadium, exciting lumberjack-themed competitions, and audiences participating in the fun it’s no wonder the Feud is a year-round destination. The show is fast-paced with real lumberjacks showing off their expertise during each of the 11 challenging competitions. Our champion lumberjacks have quick reflexes, great balance, and on-target precision. They make each competition look easy whether they’re in a speed-climbing competition or attempting to be the fastest to saw through a thick log. Watch the lumberjacks take aim with an axe and hit the bulls-eye right on target, or as they compete against each other in maintaining their balance on the fast-moving log roll. When the award-winning lumberjacks from the Dawson and McGraw families take the stage, you’ll cheer for your team during each competition to win lumberjack “cookies” – which get shared with the kids. Get involved by taking part in the same competitions as the lumberjacks by signing up for the Adventures. That’s right, adults and children can experience the competitions for themselves in the Springboard Chop, Speed Climb, Cross-Cut Saw, Log Roll, and the Boom Run competitions. At the High Woodsmen Challenge, kids ages 7 and up are challenged by 28 lumberjack-themed obstacles. If you’ve always wanted to get a bird’s eye view, The Flying Ox can make it happen. The ride provides a dual opportunity of seeing Lumberjack Square in what’s described as a “roller coaster blended with a zipline” adventure. At Timber Towers, treat the butterflies in your stomach to their own memorable lumberjack experience when you take a leap from an 80-foot tower fitted with assorted jump elements. Taking on the challenging obstacles of the course is fun, and safe, as participants are securely connected with harnesses and other safety equipment while maneuvering the action-filled course. In order to participate in the Adventure, kids must be at least 7 years of age, and through age 11 must have someone 16 or older accompany them. Weight restrictions are no heavier than 270 pounds, and all participants must wear closed-toe footwear. Lumberjacks need their strength to take on challenging competitions and several dining options are available at Lumberjack Square. Choose from the menus at Calhoun’s, Smoky Mountain Brewery, and Five Guys to please your palate. For your convenience, you can dine at one of the restaurants before or after the show or get it to go and enjoy during the show, or you can bring your own food and beverages. What a great idea for a show – bring your own food in to eat while you enjoy the fun! Whether Pigeon Forge is experiencing rain or shine, the show must go on. The climate-controlled grandstand keeps visitors comfortable and protected from the elements throughout the year. Feel free to bring your camera and take some memorable pictures of the lumberjacks in action. After the show, lumberjacks are available for pictures and autographs. Please note, video recording is not allowed. Shows are scheduled on select days in January, February, and part of March with a start time of 5:00 p.m. Beginning on March 11 through December 31, shows are scheduled with 2:00 p.m., 5:00 p.m., and 8:00 p.m. start times depending on the day and month. Each show lasts approximately 90 minutes. It’s recommended arriving 30 minutes before show time as both parking and seating is first come, first served.